I’m one of those painful people called “perfectionists”! I spend nearly as much time unpicking and resewing as I do in stitching in the first place. If I can’t do something well, I don’t do it at all – eg I would never play chess, because I knew my brilliant son would beat me! I always have to fix mistakes – other people’s as well as my own! I’m always correcting grammar, like telling sporting commentators from my lounge room that they’ve used an adjective instead of an adverb – pity they can’t hear me! My personality of course carries over to my stitching. 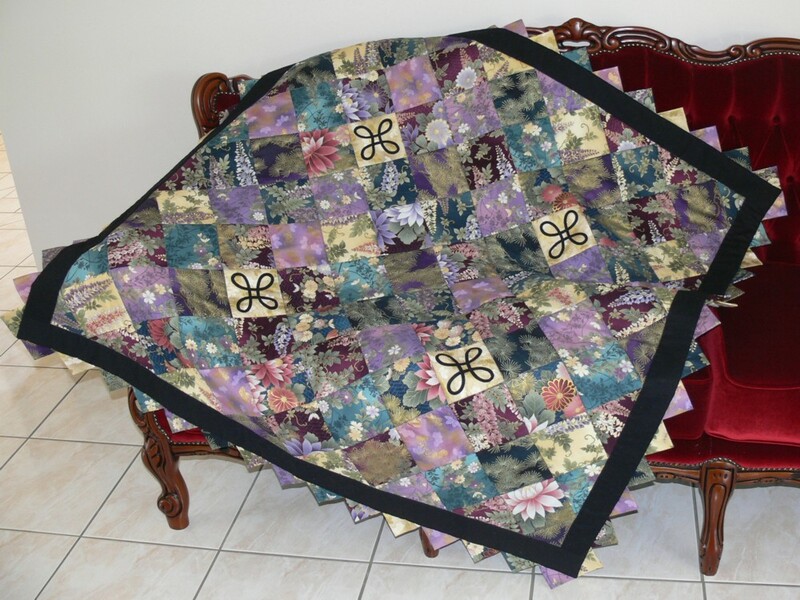 If you look at my designs, you will see dozens of needle-cases, bags, cushions, wall-hangings, stitching accessories, but only a handful of quilts. That’s because I’m an imperfect piecer! I admit that embroidery is my first love and so it is easy to put all my effort into that. I don’t find sitting at a sewing machine sewing little pieces together for a quilt all that enjoyable, especially when they don’t turn out 110% accurate. 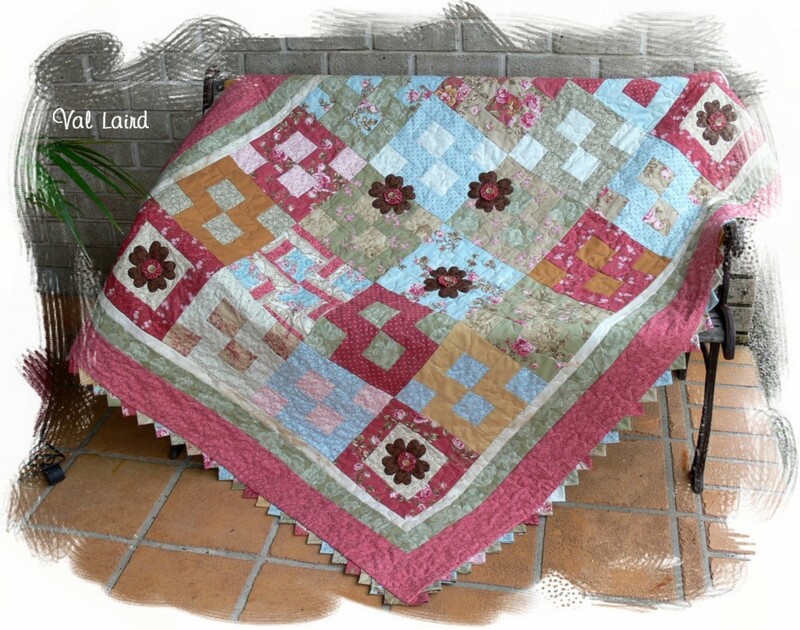 I become disappointed with the result, and therefore I don’t sew many quilts! Over the years, I’ve learned ways to get by, like designing quilts without points, or using ‘disappearing’ blocks that look as though you’ve done amazing piecing, or using lots of appliqué to get the focus in the right place! 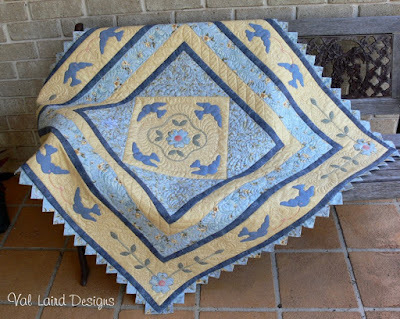 We have a half-sized Pool Table which is always covered with a quilt when not in use, which quilt is now VERY faded and drab. 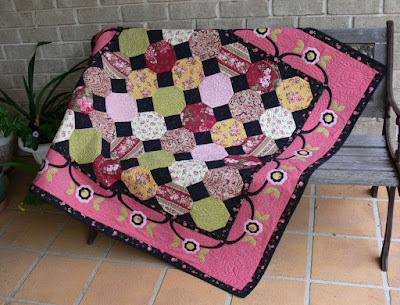 As only a quilt will do, I have to face my fear of imperfection and get going and make a replacement. I wanted to use the Arbor Window block (aka Granny Square), but oh dear, all those hundreds of points with the potential to be not quite perfect. After a pleasant time looking at lots of wonderful quilts using this block on the internet, I discovered the possibility of making beautiful square blocks with no points to align! Out with the calculator, some scraps, and plenty of enthusiasm, and after a couple of attempts at getting the right triangle sizes, I have had success. I don't mind the small bit of wastage involved, when I can achieve perfect points and accurate square blocks. Nesting the seams makes it easy to line up the square blocks in their rows, which is about all the aligning that I have to worry about. I am now facing the making of this quilt with a totally different attitude. Once again, I have decided to use the Quilt-As-You-Go method. 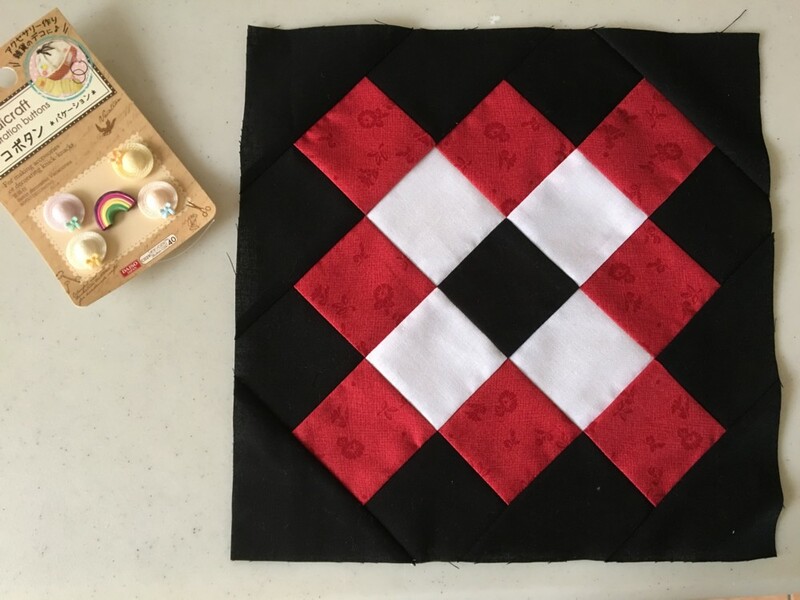 I feel as though I have somewhat perfected my favoured version of this QAYG technique now and I certainly find it easier quilting small blocks instead of a whole quilt. 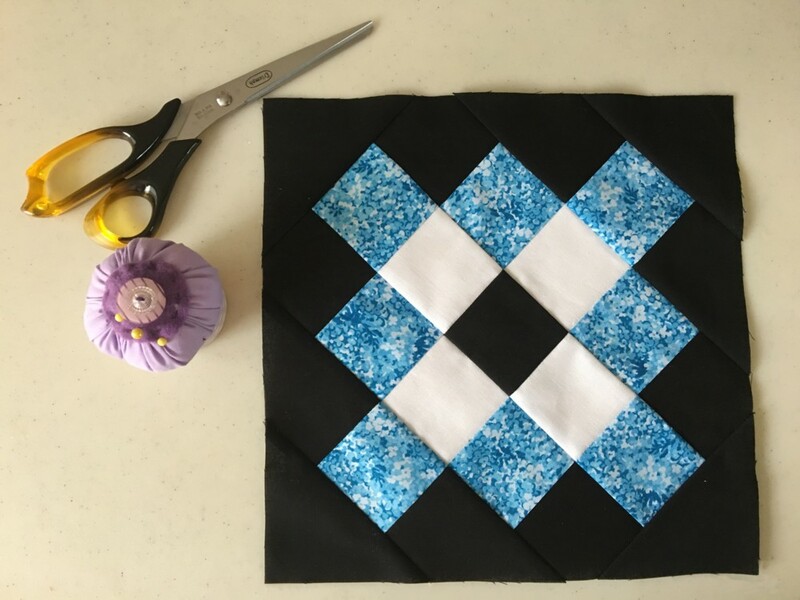 I have one other admission to make - using a cutting die (I have an Accuquilt Go) means I start with very accurately cut shapes, and this has certainly helped my piecing to improve. 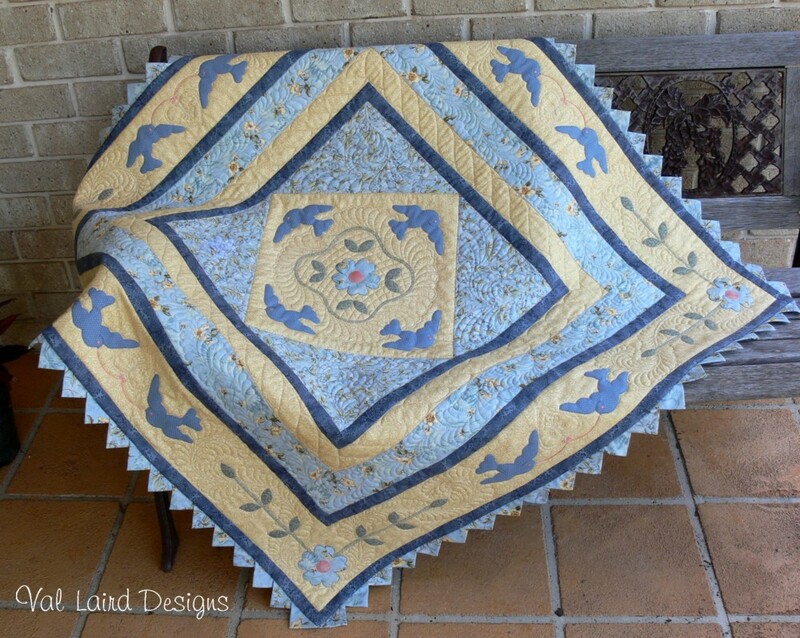 Who knows, one day I might even make a Dear Jane Quilt! Your work always looks great but it is good for those of us like myself with less skill than I see in your work to hear that others are also disappointed with some of their work. I cringe when I look at a cushion that I made a number of years ago where the points don't match. I love the fabric and colours so it still sits on my bed. Can I be cheeky and ask what is the method you have discovered to ensure the points are accurate? I understand it you would prefer not to say. I always love to see your work, and it's a thrill to me if I buy a magazine and find one of your designs in it. Oh Val, what a time you must have. I love the square and it looks lovely. I love your patterns and would love to do them all but a girl can dream, right? I don't think I have seen anything on your quilting as you go method. I have a way but I'm always ready to learn more. Thank you for sharing you amazing patterns to the world. I think that is an ideal block to choose..lining up squares is fairly fool proof - but please continue to correct grammar!! My husband seems to think the AFL referees (umpires??) can hear him 1000km away.